KSRealityBites: Restless Legs Syndrome signals brain malfunction! Restless Legs Syndrome signals brain malfunction! Researchers have found that people suffering from restless legs syndrome (RLS), which causes uncomfortable sensations in the limbs, have reduced function in an area of the brain important for controlling movement. Preliminary results from a new study at Neuroscience Research Australia (NeuRA) suggest that such people 've up to 80% less function in this brain region compared to healthy people. Kay Double, associate professor of neuroscience says "This is a disorder that is thought to affect one in twenty people, & can severely affect quality of life, but we still don't know very much about it." According to a NeuRA statement, Double says, "This study is helping us understand what happens in the brain to cause these symptoms, which will help us find better treatments." Restless legs syndrome is a disorder that causes uncomfortable sensations in the limbs. It often flares up at night & disturbs sleep. It tends to run in families. The NeuRA study is using ultrasound & magnetic resonance imaging (MRI) to look for changes in the structure & function of the brain. 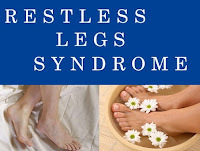 Double says, "This is the first time that anyone has looked for these type of changes in people with restless legs syndrome. If we can understand what is happening in the brain, we will be one step closer to helping the thousands with restless legs get a better night's sleep & lead a better quality of life." Stress reduction is one of the great techniques to treat restless leg syndrome. However, when the disorder is caused by damaged or compressed nerves in the neck, treating those conditions should go some way toward curing restless leg syndrome.